One of the first modern quilts that I ever stumbled across was a modern variation of a kaleidoscope quilt. Ever since that day I haven't been able to shake the pattern from my mind. 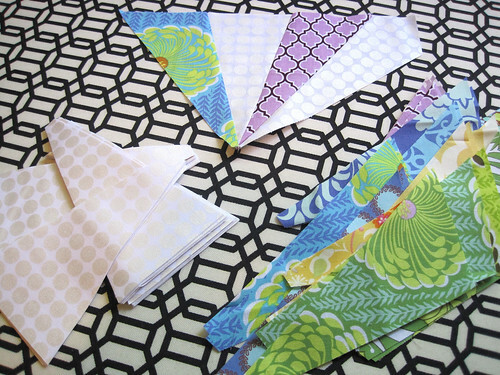 It took a bit of time but I have now successfully cut out 480 fabric pieces, getting one step closer to making my own kaleidoscope. The pattern template pieces sew together remarkably quick and accurate. 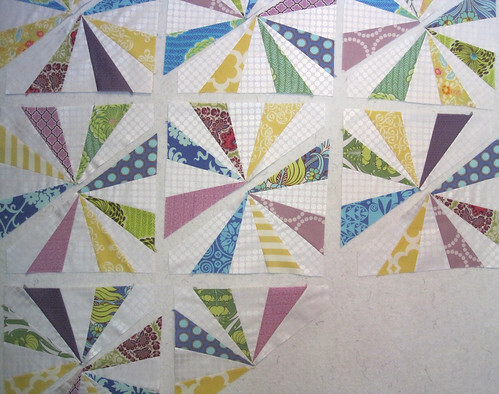 I haven't needed to use a single pin surprisingly, and yet my blocks are turning out quite square. I'm crossing my fingers and toes that these blocks will require only minimal trimming, and so far it's looking good! 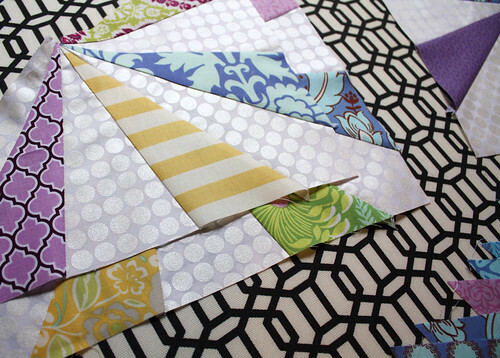 I love seeing some of my favorite fabric lines come together and merge into one happy little place. Nearly eight blocks down, only twenty-two more to go. I'm really enjoying the process of watching my design wall grow with these vibrant colors. I often find that surrounding myself with a beautiful array of fabrics is all I need for motivation to keep on sewing. 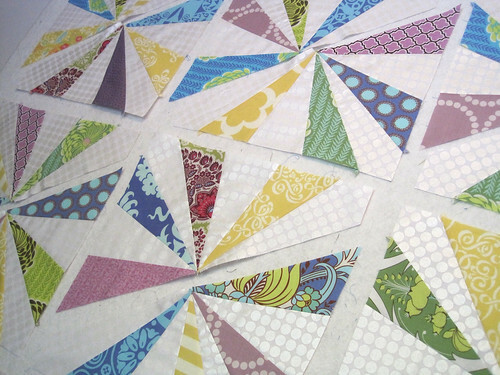 Hands down this quilt is shaping up to be one of my favorites to date. Wow. I love this quilt so much! Too bad you live so far away, otherwise I would be coming to steal it ;-) I especially love the use of mirror ball dots as background. Wow those look great. I love the disco dots in there very appropriate for a kaleidoscope! Love this! the colours work so well together, I love those dusty tones and it's a simple but so effective and well executed design! IN fact I've just been taking a little look around and I have to add you to my reader! Isn't it wonderful to have been dreaming or obsessing about a quilt... And then when you begin to actually work on it, it comes together just as imagined? Happy for you that it is going sew well! Looks great and can't wait to see the big finish! This one is going to be outstanding! Can't wait.